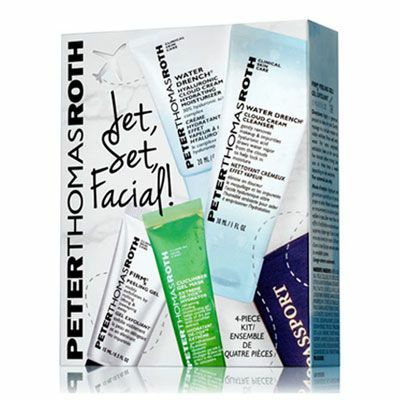 Peter Thomas Roth Jet Set Facial Kit - 4 pcs is all you need: cleanser, breakthrough exfoliator, gel mask, and hydrating moisturizer. It is a must-have travel size for your skin care regimen. Containing Water Drench® Cloud Cream Cleanser A non-fragrance cream facial cleanser that gently cleans away makeup, excess oil and impurities. Including FIRMX® Peeling Gel A breakthrough exfoliator that removes impurities and decongests pores to reveal youthful, radiant, firmer-looking skin. Plus Water Drench® Hyaluronic Cloud Cream Hydrating Moisturizer is An ultra-hydrating moisturizer that drenches your skin with a fluid cloud of natural, endless moisture drawn from the clouds. And Cucumber Gel Mask Extreme DE-TOX™ Hydrator is an ultra-gentle gel that is excellent for assisting to relaxed and calm the skin�s appearance after sun damage, peels, waxing, facials, and extractions. Helps invigorate, tone and minimize the appearance of pores. Helps lightly and naturally hydrate skin. Helps calm and de-puff the appearance of skin. Provides continuous moisturization for up to 72 hours. Start with the Water Drench® Cloud Cream Cleanser clean and invigorate skin. Next FIRMX® Peeling Gel and then use the Cucumber Gel Mask for an extreme detox hydrator and to uncover a smooth or soothed complexion. Finish with the Water Drench® Hyaluronic Cloud Cream Hydrating Moisture for a liquid cloud of pure, endless hydration. Apply a generous amount to clean, dry skin. Gently massage in a circular motion to visibly exfoliate. Rinse well with water. For extra enzymatic exfoliation, leave on for one to five minutes before rinsing. Use one to three times a week depending on skin sensitivity.